Every church has a start date, even as Jesus established His Church in Matthew 16:8. 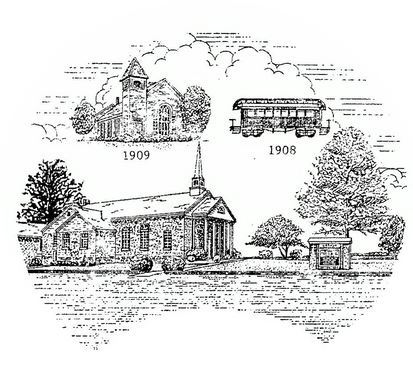 Church life at Nashua Baptist is now beyond a century since the church was established in 1908. For any church history buffs who are interested, there is available the "Nashua Baptist Church 100th Anniversary" compendium, published on August 3, 2008. This historical copy is kept in the NBC office. Briefly noted below is what occurred "in the beginning" of church life at Nashua. Today, the NBC fellowship continues with the desire to glorify God in all and whatever we do. IN THE BEGINNING. Nashua Baptist Church had its beginning when the American Bible Publication Society sent a Chapel Car, "The Messenger of Peace," to the area in midsummer of 1908 with Rev. J. S. Davis, missionary in charge. It was set on a temporary siding in the rail yards at Nashua and the connection to the main line was removed so there would be no interruptions and the car would not interfere with switching operations of the railroad. The railroad was known as the Quincy, Omaha & Kansas City Railroad. The main street through Nashua is now known as North Oak Trafficway. The depot and post office were the first buildings in Nashua built in 1894. The post office was located about a block north of the depot. The chapel car would seat 80 people and Rev. Davis began holding preaching services on Sunday morning and evening and began to seek out members of missionary Baptist Churches who lived in the community. This work went on for almost a year when the call went out for an organizational meeting, so on August 16, 1908, Nashua Baptist Church was organized. TODAY, and IN THE FUTURE. Nashua Baptist Church continues as an important component in the Northland community. NBC's purpose of serving and ministry is stated, simply and profoundly according to God's Word, in I Corinthians 10:31 --- "So, whether you eat or drink, or whatever you do, do all to the Glory of God."